About: Julep Dupree tells lies. A lot of them. She’s a con artist, a master of disguise, and a sophomore at Chicago’s swanky St. Agatha High, where her father, an old-school grifter with a weakness for the ponies, sends her to so she can learn to mingle with the upper crust. For extra spending money Julep doesn’t rely on her dad—she runs petty scams for her classmates while dodging the dean of students and maintaining an A+ (okay, A-) average. Tiffany N’s Thoughts: The book wasn’t all too bad, but the plot was easy to read and I could already figure out was going to happen at the end of the story. As soon as I started reading, it reminded me of the Heist Society series by Ally Carter.The title was very intriguing, but the book wasn’t what I expected. In the beginning Julep was very clever,calm, and sharp, like a real con artist, but as the book progressed, it seemed to go downhill. I would have enjoyed it better if her mentality and skills got stronger, not weaker. She also seemed to trust the wrong type of people even thought she’s a con artist. Shouldn’t con artists be able to tell the difference between lies and the truth? There was also some kind of cliche romance. To me it doesn’t really fit well into a book like this. I would rate this book a 7 out of 10 and recommend this to a friend. Anesa A’s Thoughts: This book reminds me of Ally Carter’s Heist Society. I fell in love with the title and the cover of the book, but unfortunately, the story didn’t live up to my expectations. I feel like it lacked the exhilirating rush that mystery novels usually contain, and I didn’t understand how the protagonist could be so ingenius and amateur at the same time. Julep starts off as calm under pressure and a master at her craft. She is suppose to be clever and analytical but as the story progresses she loses that. Yes, I know the emotional strain of losing her father affected her but a master con artist can’t be easily swayed. She knew her dad’s lifestyle carried risks so she should have approached the situation in a calm calculating manner. Julep also had a dramatic tendency to think that she was alone against the world but there were people who cared about her and wanted to help her. Perhaps I’m too harsh but seriously, I expected more from this book. 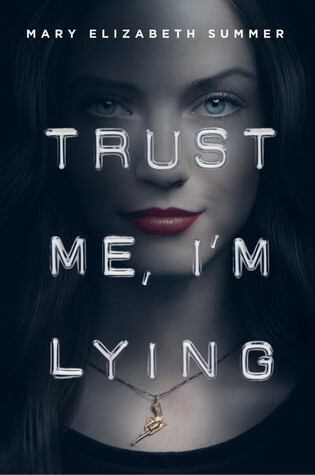 I heard there is a sequel for this book,”Trust me I’m Trouble.” However, this book didn’t keep me on my toes and keep me wanting to read it so I’m going to pass for the sequel. This entry was posted in Murphy Middle School, TX Lone Star List 2016 Nominee and tagged Mary Elizabeth Summer, Murphy Middle School, mystery, Trust Me I'm Lying, TX Lone Star List Nominee 2016. Bookmark the permalink.